Mature father with a small daughter outside, painting. Wooden birdhouse or bird feeder making. Slow motion. Unrecognizable father with a small daughter outside, painting. Wooden birdhouse or bird feeder making. Slow motion. Mature father with a small daughter outside, painting. Wooden birdhouse or bird feeder making. 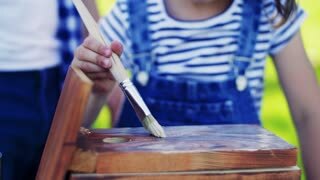 A small girl outside, painting a wooden birdhouse or bird feeder. Slow motion. 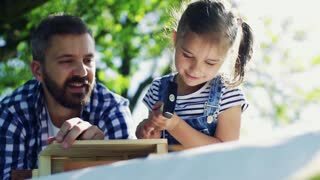 Father with a small daughter outside, making wooden birdhouse or bird feeder. Father with a small daughter outside, planning a wooden birdhouse or bird feeder. Sketches making. Father with a small daughter outside, making wooden birdhouse or bird feeder. A little girl hammering a nail. Slow motion. 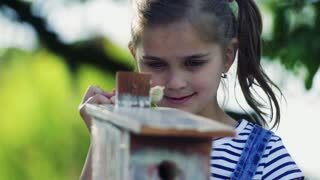 Father with a small daughter outside, making wooden birdhouse or bird feeder, measuring.